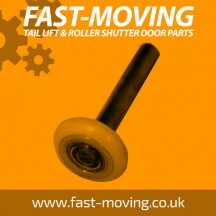 Dry freight & refrigeration track rollers & bearings. There are many manufacturers of dry freight roll up door on the market. We can offer you interchangeable products at a competitive price to help you repair your dry freight roll up shutter door. All rollers & bearings supplied are manufactured by Fleet Engineers in USA and are are the very highest standards in quality at an affordable price. Fleet Engineer replacement parts are suitable as some replacement components of many door types including :-Dry freight, Coldsaver, JR Industries, Whiting doors, Mobile doors, Henderson doors, Todco doors, Boyriven FIT doors.